Pergolas and arbors are a great way to transform your home, create visual appeal, and expand the usable space of your yard or outdoor area. These decorative structures are a wonderful way to give the feel of an extra room without the additional expense of a costly home renovation. Pergolas can be built as a free standing structure or can be connected directly to an existing wall of your home. Pergolas and arbors are usually constructed out of cedar, cypress, or vinyl materials. You have several options available for the appearance of the support columns including stucco, stacked stone, ornate round column kits, or natural wood. 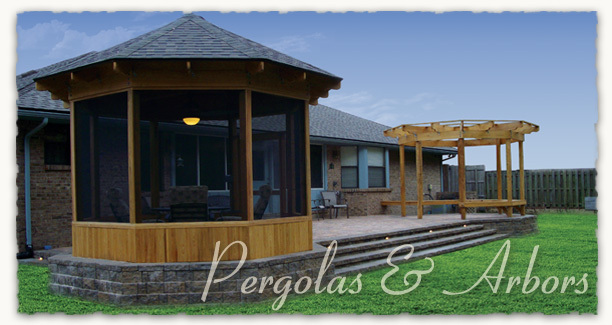 Pergolas add class and style to any outdoor area and are perfect for providing shade during the Florida summer months. Pergolas are an excellent addition to an existing outdoor seating area making a great place for freinds and family to gather and enjoy the outdoor lifestyle. Garden arbors add visual appeal to garden pathways and provide excellent support for vining plants such as wisteria or honeysuckle. Pergolas can be constructed to virtually any shape or size needed to perfectly fit into your existing outdoor area. Circular pergolas are especially attractive and can be built to match any brick paver circle kits with integrated bench seating. Pergolas can also be built attached onto an existing exterior wall of your home. This is a great solution for existing decks or patios that receive large amounts of direct sunlight.